Like Lathem, we all have outdoor entertaining on our minds here at Nandina Home & Design, especially with our annual spring entertaining event, A Night In Iberia, taking place tomorrow. During this glorious time of year, the opportunities to entertain family and friends seem endless, so it’s important to make sure that you’re equipped with stylish supplies for all of your needs. Today we are highlighting one of our favorite outdoor entertaining vendors, Kalalou! Kalalou began as a company called Country Originals, established by a young married couple who were selling their artwork at flea markets to help make ends meet. They eventually added baskets to their flea market endeavors in Mississippi and after a trip to Jamaica, they began importing Jamaican baskets and developed their business, selling their products at the Dallas Wholesale Show and eventually, establishing their company. Since the 1980s, Country Originals has expanded its product line to over 1500 items sold in over nine countries, and of course, changed names to Kalalou. Kalalou is a Creole word used to describe a type of soup that is never made the same way twice in a very social setting, and it is a perfect term to describe Country Originals’ unique mix of artisan products and how they are crafted, thus the company’s name was changed to reflect its expanded catalog. The new name Kalalou also plays on the fact that the company’s story has been told several times in company catalogs. Below are a few of our favorite Kalalou products, which you’ll see if you attend A Night In Iberia tomorrow night. These gorgeous pieces are perfect for a spring garden social, don’t you think? 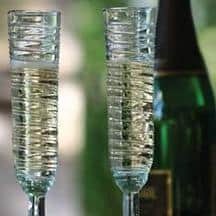 These lovely champagne flutes would not only be perfect for entertaining, but also for a fabulous wedding gift. This decanter with a side ice pocket makes it easy to keep the drinks cold. Kalalou’s stemless wine glasses are an elegant play on the old Mason jar look that is so often seen here in the South. We consider the tilted pitcher to be an entertaining essential. Pops of accent color are the best way to polish off the design of your outdoor entertaining spaces. We love Kalalou’s colorful lanterns!